The Kia Rio is a well-built, practical supermini that's a great choice for anyone who requires a reliable runabout that's economical to run and fun to drive. There's a good amount of space available for passengers and while the interior styling of the vehicle is largely functional, higher-spec models come equipped with plenty of innovative technology. 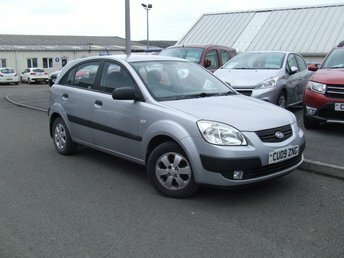 You'll find some great deals on used Kia Rio models for sale in Haverfordwest when you come to NTR Cars. Take a moment to view our complete range of used cars online and feel free to contact a member of the showroom team if you'd like more information on any of the vehicles listed. Finance is available to UK residents aged 18 years or older, subject to status. Terms & Conditions apply. Indemnities may be required. Other finance offers may be available but cannot be used in conjunction with this offer. We work with a number of carefully selected credit providers who may be able to offer you finance for your purchase, commission may be received. We are only able to offer finance products from these providers. Postal Address: NTR Cars, Johnston Business Park, Johnston, Haverfordwest, Pembrokeshire SA62 3PL. Find contact details here.